Welcome to the AgMIP Data Interchange web portal, designed to provide open access to AgMIP member data. Please sign up for free membership to access all site features and upload data. If you are already a member please login above. 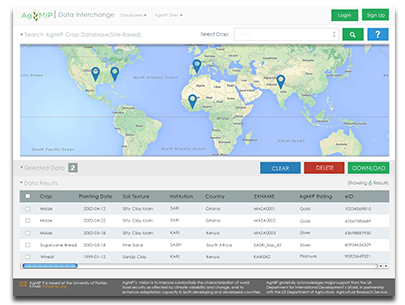 The AgMIP Data Interchange provides open access to global and regional climate, agricultural, and economic data uploaded by AgMIP members. It also provides connections to collaborating databases. Click below to start your search and download data.